The rapidly expanding Thai manufacturer has set its sights on the Malaysian market and launched the GPX Demon 150GR in 2018. The Demon is a minibike equipped with a 150 cc engine. The bike is styled to look like the Ducati Panigale and comes packed to the gills with equipment like KYB upside down forks, digital instrumentation, LED lighting, fully faired body Diablo Scooter tires and disc brakes. The bike is on sale for a very competitive price of RM 8000. Have a question on Demon 150GR? Demon 150GR is available in 1 different colors - Red. GPX is a Thailand based motorcycle manufacturer that has made some very big strides since its birth in 2007. This year they plan to launch themselves in the Malaysian market in a big way. They already have a presence in the Philippines, Cambodia, and Singapore and after the second quarter of this year, will have one in Malaysia too. The first of these launches is the GPX Demon 150GR. A minibike that looks like a Ducati Panigale, is not something that you see every day. That too from an unheard of a brand like GPX. Even before asking how good or bad is this bike in question, we need to know just what is this bike. And probably why Ducati hasn’t sued them for plagiarism. Two things are evident from the very first look. First, it’s a mini bike. And second, it looks very much like a Ducati Panigale. So first, we tackle the size of the bike. Yes, it is a mini bike. Like the Honda Grom. Its dimensions are 1835 (L) X750 (W) X 1050 (H) mm. The seat is just 780 mm high off the ground. The wheelbase is 1230 mm. The small proportions are noticeable from the start. The most defining characteristic, however, have to be the 14” wheels. These give the bike a low sporty stance. But these small wheels are shod with sizeable 120/70 tires in the front and 140/70 tires in the rear. These thick tires show that this bike tries to hit above what its small size may suggest. This brings us to that other aspect of the bike. The styling clearly aims to be out of this world. 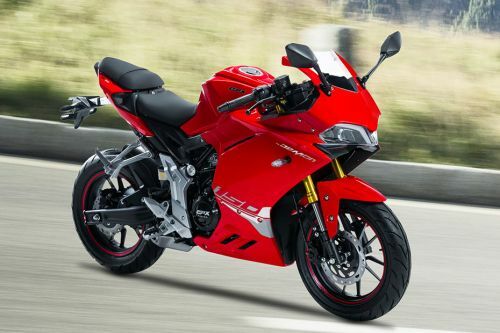 It does a very good job of appearing like a scaled down version of the famed Ducati Panigale. Especially in red – one of the three color options other than black and white – with minimal graphics. The headlight cluster is almost identical and uses LEDs for headlights and DRLs. Same goes for the taillights. The sporty fairing covers the entirety of the front. The tail section itself is tiny and may not be advisable for pillion riders despite coming with its own seat. The exhaust is tiny and tucked under the bike. There is also a high windshield and a compact and high fuel tank that complete the look. This tiny bike is equipped with copper-colored upside down shocks and disc brakes on both wheels along with fully digital display and clip-on handlebars. There is a small lockable storage space under the pillion seat and a USB charging port under the display too. So even if it is small in size, this is no small fry. The bike has a trellis frame and an upside-down telescopic front fork set up with a monoshock in the rear. Those front forks are from KYB. The slightly high seat and low set and narrow clip-on handlebars mean that rider sits on the bike with a more than slight lean forward. The legs will be hugging the contoured tank and the seating position is tight because of the small stepped seat and the position of the foot pegs. At 130 kg, this bike should be an agile handler, especially because of the thick tires, which are Pirelli Diablo Scooter tires by the way. The GPX Demon 150GR uses a 149 cc air-cooled and carbureted engine. There are no performance figures revealed at the moment. The engine being air cooled does get quite hot under the enclosed fairing. Still, the engine is good enough to propel the bike to speeds of up to 75 kmph. There are disc brakes in both the front and the rear doing braking duties. To be precise, there is no additional safety measure that has been offered by the manufacturer in this offering. What are the Safety Features Available in GPX Demon 150GR? Is GPX Demon 150GR available in Electric?